This is our official list in search of the best charcoal grills on the market today. Scroll further down for full details on each product and information on grilling with charcoal. Well into the information age, certain turn-of-the-century debates continue to rage on, like which is better when it comes to grills: charcoal or gas? While charcoal grills may not be as quick and convenient as gas grills, they continue to be a popular choice amongst food purists and grilling enthusiasts. The most primary advantage of course, is that they create actual smoke which adds a delicious taste to your food you just can’t get with a gas grill. Charcoal grills have even gone green, with a number of great alternatives to traditional charcoal briquettes, which may contain dangerous toxins that can contaminate your food. Modern briquettes, however, are made of a number of different ingredients – like coconut shells – that are not only better for you and the environment, but even add a delicious hint of flavor to your food. For those that land staunchly on the charcoal grill side of the debate, here are 5 of this summer’s hottest and best charcoal grills. 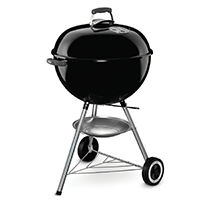 For those that love the old classics, the basic standards and the age-old tried and true, there is the Weber 741001 Original Kettle 22-Inch Charcoal Grill. This is the grill that your father and grandfather grilled on and to this day, it still remains one of the best charcoal grills on the market. If one of your first images of true manhood was your father standing over an old dome shaped Weber Kettle Grill, charring steaks to perfection, then you will love this standard classic in a shiny new finish. Two wheels allow you to roll it away from the house when lighting her up and rolling her back under a protective patio cover when you are done. A single ash pan catches loose ash as it falls. Dump it out occasionally, scrub the grill grate and you’re good to go – no fuss, no muss. For those that don’t need a giant grill for large gatherings, there is the Char-Griller 2-2424 Table Top Charcoal Grill. Not only will you use less charcoal than with a full-size grill, but the Char-Griller Table Top Charcoal Grill also doubles as a Texas style smoker. Heavy steel construction and cast iron cooking grates mean you can pass on both your skills and your grill to your kids and grandkids. Small and portable, you can take it to the park or beach for a picnic and still get 250 square inches of useable cooking space. For those that like to have Texas-sized BBQ’s the old fashioned way, there is the Char-Griller 2137 Outlaw Charcoal Grill. 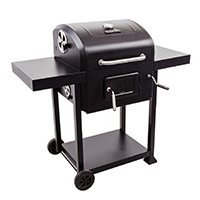 Featuring the same great design as the Char-Griller Table Top Charcoal Grill (which can actually be attached to the Outlaw Charcoal Grill and used as a side firebox) but with a much larger cooking area, the Outlaw Charcoal Grill is a great addition to outdoor spaces with a more traditional look and feel. 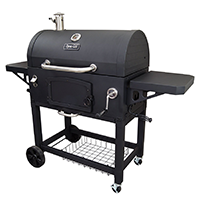 Like the Char-Griller Table Top grill, the Outlaw also doubles as a smoker and features heavy gauge steel construction for years of use, cast iron grates that provide even heat and lock in flavor and an airtight flanged hood with a heat gauge. The Outlaw offers a whopping 1065 square inches of total cooking area, which is divided into a 725 square inch main grill area and a 340 square inch warming rack. If you’re looking for a classic charcoal grill with a slightly more modern flair then this is the grill for you. Composed of a flat black body, with stainless steel hardware and accessories, this grill is as stylish as it is functional. 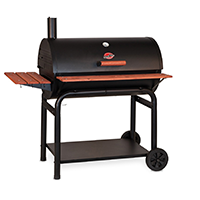 The Dyna-Glo Premium Charcoal Grill features a charcoal basket adjustable tray system, which gives you ultimate control over precise heating and a front access door for adding more charcoal. 3 heavy duty cast-iron grates covered in porcelain enamel sear foods to perfection and lock natural juices in tight. Heavy duty wheels and locking casters on the grill cart provide both security and maneuverability and a storage basket, side shelves and a bottle opener provide everything you need to prep, store utensils and enjoy a cold one while you are cooking. For those that want a slightly smaller grill – but not as small as a table top grill – while still offering great features and functionality as well as a slightly more modern design at a moderate price, then this is the grill for you. The Charbroil charcoal grill is about the same size as the classic Weber Kettle Grill, but with a more modern design and the same flat black and stainless steel look of the Dyna-Glo Premium Charcoal Grill. 580 square inches of cooking surface is divided between 480 square inches of primary cooking surface covered with a cast iron grate and 180 square inches of secondary cooking surface covered by a porcelain coated grate. 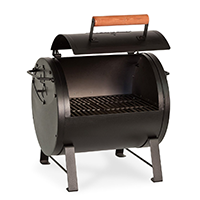 Like the Dyna-Glo Premium charcoal grill, the Char-Broil offers a front access cast iron door for tending fire with minimum heat loss as well as an adjustable fire pan to help maintain perfect heat control. Whether you are looking for something small, light and portable, or something that the whole (extended) family can enjoy, there is a charcoal grill just for you. From the traditional to the contemporary and stylish, whether you are looking for great looks or great features, there are a wide range of modern charcoal grills to choose from.